Do you like nasturtiums? I LOVE nasturtiums. They are one of my favourite plants. I love the way they grow all over things and the way their flowers are so bright and colorful. I love the peppery taste of the leaves and flowers, and that you can eat every part of the plant. I love the fact that they have such an unlikely-seeming botanical name… NOT Nasturtium officinale as any sensible person might think, but Tropaeoleum majus (N. officinale is actually watercress! Go figure. But at least I can remember it). Place the first three ingredients in a food processor and blitz together. Add olive oil in a stream and keep blending until you have a smooth-ish paste – I didn’t really measure but I imagine I used at least half a cup. Taste and add salt if you like. Scrape into a clean jar and cover with a layer of oil to help keep it fresh. Cap tightly and store in the fridge. Or, fill an ice cube tray & freeze, popping the little blocks out into a freezer bag for longer storage. 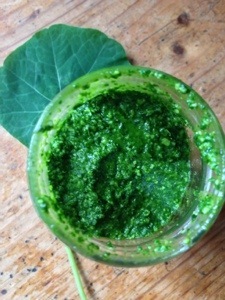 Let me know if you try it, or if you have any other unusual pesto recipes, or if you love nasturtiums too!